Dr. Eleni Bardaka is an Assistant Professor in the Department of Civil, Construction, and Environmental Engineering (CCEE) at NCSU. 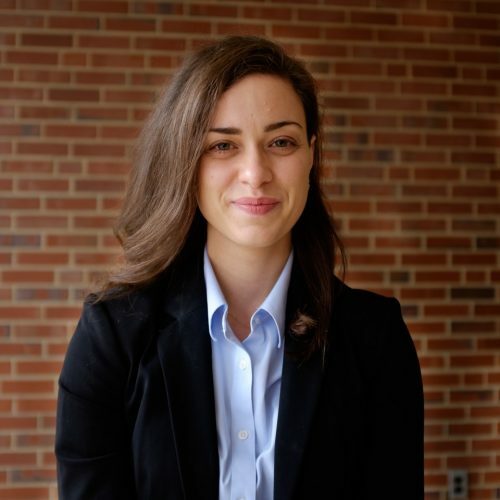 She is primarily associated with the Transportation Systems group within the CCEE Department and is interested in transportation planning and economics research. Dr. Bardaka currently teaches CE 297 – Introduction to Sustainable Infrastructure and CE 401/501 – Transportation Systems Analysis. Dr. Bardaka is interested in the relationship between the spatial patterns of urban development and transportation interventions. She mainly focuses on urban phenomena such as gentrification, segregation, and displacement and on how they relate to transportation investments and policies. She is currently studying the socioeconomic impacts of urban rail, including the gentrification and economic displacement of lower-income households, as well as affordable housing schemes close to transit systems. In her research, she uses spatial econometric analysis and quasi-experimental methods to test if there is a causal link between a transportation intervention and a socioeconomic outcome. She also supports state agencies with research related to highway-induced local and regional economic development, cost-benefit analysis of different projects (such public-private partnerships and toll roads), and evaluation of alternative revenue sources. Bardaka, E., Pyrialakou, D., & Gkritza, K. (2016), In 95th Annual Meeting of the Transportation Research Board. The objective of this research is to investigate the spatial and temporal distribution of economic impacts of beltway investments on residential and commercial property values in North Carolina. The study will focus on three major highway investments constructed at various times between 1990 and 2015 in North Carolina: (1) I-540 Northern Wake Expressway, (2) Greensboro Southwest Loop, and (3) I-485 Charlotte Outer Loop. A hedonic price model with difference-in-differences estimators will be used to investigate the spatial distribution of treatment effects around highway access points. This research will give answers to the following questions: 1) What is the extent and overall spatial distribution of a highway investment's effects on surrounding property values? 2) What is the time frame and magnitude of the timing of anticipation and treatment effects in relation to construction dates? In addition, as part of this research project, we will develop presentations for internal use to NCDOT for knowledge transfer purposes. The presentations will focus on the results of the previous and current research and how they can be used by NCDOT staff. With nationwide declines in public transportation ridership, transit may be falling behind in its ability to help cities deal with congestion. Increasing real-estate values are causing the economic displacement of low-income populations, those most closely associated with transit ridership. A plethora of new mobility options are providing alternatives for transit riders who can afford them. But how will access to transit, ridership, and congestion be impacted by these shifts in demographics and the introduction of new mobility services? This project includes researchers from four universities in the STRIDE partnership that together will address access to public transportation issues with specific contributions in suburbanization of poverty, Transportation Network Companies, healthcare access, and vulnerable populations. In thrust 1, a methodology will be developed to assess the externalities of the phenomenon of suburbanization of poverty with respect to access to public transportation. In addition, this thrust will provide a detailed analysis of sociodemographic and accessibility changes over time. In thrust 2, the study team will provide a model for transit ridership on a highly specific spatial and temporal scale to provide useful insights on the impact of service allocation policies and conflicting competition and complementarity happening with TNCs. In thrust 3, the study team will develop a better understanding of the interactions between public transit and TNC providers. In thrust 4, the study team will document the rapid evolution of paratransit services available to access healthcare. Although the research in all four thrusts focuses on specific areas of the southeast US, the results will be applicable nationally to aid transit and regional planning agencies. North Carolina's highways are financed primarily by taxes and fees paid by highway users. Ideally, each highway user should be responsible for contributing to the state revenue an amount equal to the cost of consuming the stateâ€™s infrastructure facilities and services. Even though it is difficult to achieve this in practice, assessing the relationship between the cost responsibility of each vehicle class and their contribution to the revenue is necessary for designing a more equitable and efficient tax and user fee structure. To date, there has not been a highway cost allocation study completed for the state of North Carolina. The proposed study will focus on the comparison of cost responsibility and revenue contribution of individual vehicle classes for North Carolinaâ€™s highways. This comparison will be based on recent infrastructure expenditures and revenue sources. The study will also assess alternative infrastructure funding mechanisms and evaluate them based on revenue potential, financial sustainability, ease of implementation, and public perception. The research will result in the following research products: (i) estimated cost responsibility of each vehicle class, (ii) estimated revenue contribution of each vehicle class, (iii) estimated equity ratio for each vehicle class, and (iv) a list of alternative revenue sources ranked based on multiple criteria. The proposed research will yield a detailed methodology for allocating highway costs and attributing revenues to all vehicle classes. The results will provide a clear quantitative understanding of the extent of costs incurred by various vehicle classes and the revenues contributed by them. This understanding will allow NCDOT to assess the appropriateness of types and rates of current taxes and fees and to devise future revenue mechanisms to meet the financing needs of NCDOTâ€™s roadway system in coming years. NCDOT incorporates economic competiveness as one of the criteria for prioritizing transportation projects and uses TREDIS to quantify the economic impact of capacity expansion highway projects as part of project prioritization. This proposal presents a project involving structured research that will document and quantify the long-term economic impact of major highway expansion projects specifically derived from projects completed as part of the 1989 Highway Trust Fund Act. The proposed study will provide NCDOT with these deliverables: â€¢	Evidence-based case studies associated with past Highway Trust Fund projects that helps demonstrate their economic benefits and impacts and communicate them to primary stakeholders of NCDOT. â€¢	An ability for NCDOT to submit case studies to AASHTOâ€™s new EconWorks initiative. EconWorks will become a national repository for case studies (replacing or exceeding SHRPâ€™s Transportation Project Impact Case Studies (TPICS) site) & potentially a more data rich analysis for states to draw from, thereby increasing the national stature and recognition of the transportation investment work being done in NC.